logo plaques with a unknown real estate company on the front of apartment buildings. You may have been asking yourself, who is the tycoon behind this huge conglomerate? Well, as it turns out this spirited entrepreneur is not a Donald Trump at all, but a very humble lone musician with what he describes as a "lot of help on my team". He has been the leader of his own rock and roll band for most of the quarter century he has been playing music for a living. His name is Bill. Off hand, and even at first glance it doesn't sound like this high school dropout would be a very responsible property owner, but it is on the contrary. He has a diploma from the School of Hard Knocks and is proud of the fact that he has taught himself everything he knows. From survival in the streets of south Chicago to the wild and wacky world of real estate. 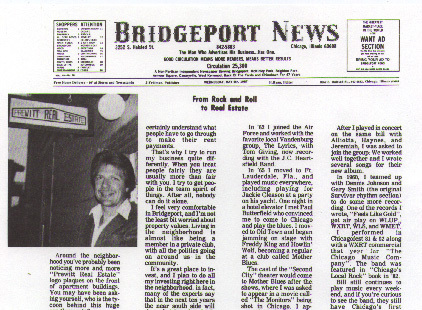 All the property he has acquired so far was purchased through the advertising classified ads in the Bridgeport News. You seldom hear him use the word "Landlord". Sitting in his modern office Bill said as he clicked away on his Apple computer, "I don't think that putting together a real estate deal makes anybody a ..LORD . It is very flattering but the tenants just call me Bill, not "Mr. anything".. I even use a Mac computer because I just like the story of the inventor. The true story goes. IBM wouldn't let him sit in on board meetings because he wasn't a college graduate so they wouldn't let him present his new idea to the company. After a couple of years he got discouraged, quit IBM, and started Apple. He became a millionaire and almost put IBM out of business at the time. I love it! Only in America. I know you're supposed to hate the landlord and all that stuff, because I always did when I was working hard just to pay the rent and make ends meet not that long ago. I certainly understand what people have to go through to make their rent payments on time. That's why I try to run my business quite differently. When you treat people fairly they are usually more than fair with you. Now that's not to say I am running a charity and sometimes people misinterpret kindness for stupidity, but I try to get people in the team spirit of things. After all, nobody can do it alone. I feel very comfortable in Bridgeport and I'm not the least bit worried about property values. Living in the neighborhood is almost like being a member in a private club with all the politics going on around us in the community. 3 Chicago mayors as come from Bridgeport and sometimes I even see movie crews filming in the neighborhood. It's a great place to invest and I plan to do all my investing right here. Look what is happening with the new hot South Loop area nearby. I always am seeing new construction and I can't believe the prices. After spending two Chicago winters living in a van (1976 & 1977) I analyzed the situation humorously as "really putting thing in perspective." I used to watch Tom Snyder late at night in my truck on a little 12 volt TV after playing earlier in the evening in the clubs. One night he had a "no money down" real estate expert on his show and I decided that was the way to go. After all I literally had nothing to lose. I went to see the expert in person at one of his seminars and he gave me a great deal of encouragement. Living in a truck was unique and it was always funny to invite people over, casually adding that I lived just around the corner. Wherever I turned off my truck---I was home! That's not to mention that anywhere I went I only had to drive one way. People would ask me if I ever became successful what would be the first thing that I would buy. Without hesitation I would reply, "A BIGGER TRUCK!" Bill still continues to occasionally play music for what he describes as "keeping my sanity". Someday soon you may see something in the newspaper like "Local boy makes good" or "He came to play the blues, but stayed to buy the buildings". Bill seems to be on the edge of greatness and one of these years he just may very well become an overnight success. We think that if the music industry ever gives him a break he could handle the success gracefully, don't you?" Bill was presented with a prestigious plaque from Carl Rosenbaum, the local president of the Bridgeport area Kiwanis Club (in 1997) for years of dedicated work with the neighborhood. He has also been given formal recognition from the Chicago Anti Cruelty Society and The Tree House Cat Shelter for donations, rescuing, and adopting stray and abandoned animals over the years. Most recently the Humane Society. As aggressive as PETA is we now feel that this may be one of the only ways to rescue the little guys. Please consider donating to http://Peta.org. Graduated 8th grade in military school as a leader on the honor roll at the very top of the class. Honorable discharge from the United States Air Force in 1964 with formal lifetime veteran status.